Msgr. Puma visiting Eva's Community Kitchen, 2008. 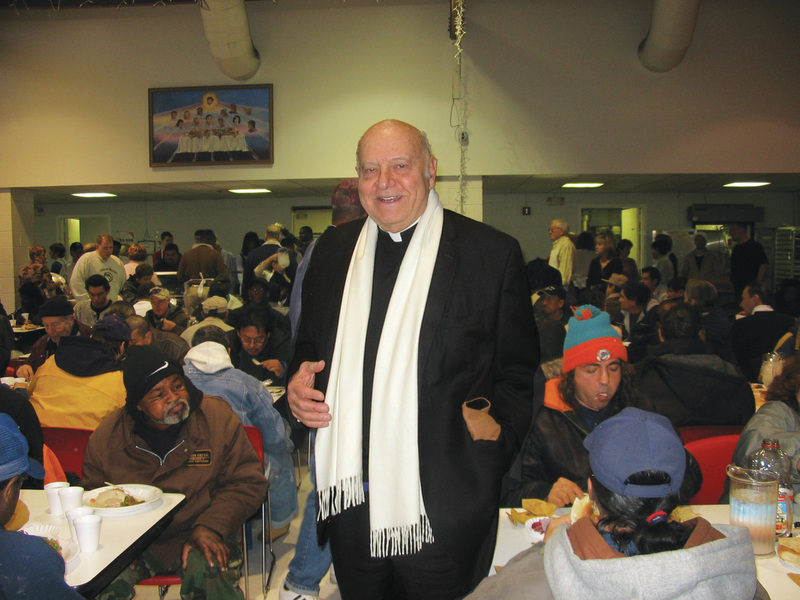 Eva's Village Founder, Reverend Monsignor Vincent E. Puma (1926-2012), served as a community leader and public servant dedicated to bringing dignity to the hungry, homeless, and addicted in Paterson and surrounding areas. In 1982, Msgr. Puma founded Eva's Kitchen, followed by the sheltering, substance abuse treatment and medical programs that fulfilled his vision of an entire village dedicated to helping people find a way out of poverty. Through his efforts, the many programs at Eva's Village have made it a uniquely comprehensive anti-poverty organization in the state of New Jersey. In addition to founding Eva's Village and serving as its first director, Msgr. 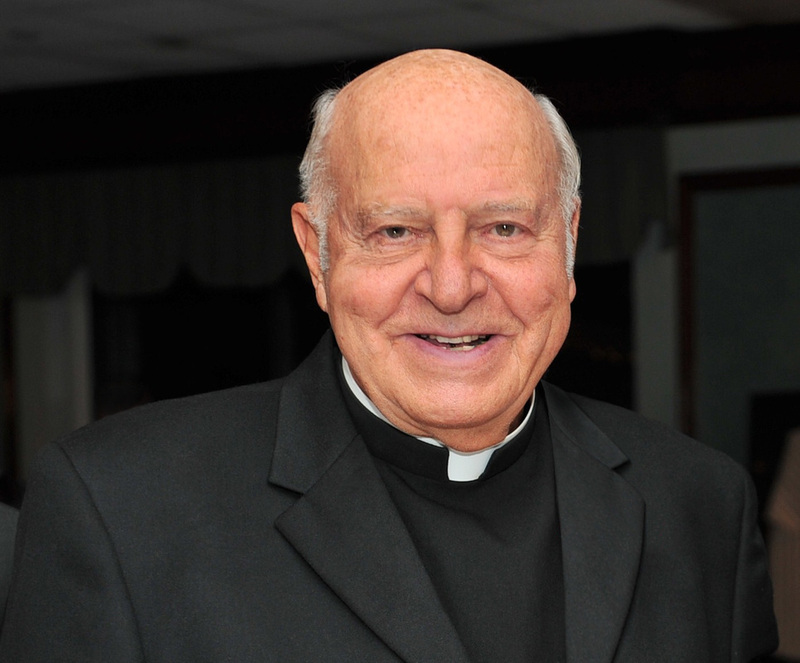 Puma served in several civic and religious leadership capacities, including Director of the Cuban Relief Program from 1961-1965; Director of the Spanish Apostolate for the Diocese of Paterson from 1964-1971; and Chairman of Paterson United Against Drug Abuse. A graduate of Seton Hall Preparatory School, South Orange, NJ and St. Charles College, Catonsville, MD, he attended St. Mary's Seminary and Immaculate Conception Seminary, Baltimore, MD. He obtained a Master's degree from Drew University, Madison, NJ, and was a licensed therapist with an ED.S. from Seton Hall University, South Orange, NJ. Msgr. Puma was named Papal Chamberlain in 1963 (Monsignor) and Prelate of Honor in 1980 (Right Reverend Monsignor). He was honored by St. Joseph's Hospital in Paterson, NJ as Man of the Year in 1992. He received the 1987 Jefferson Award for Outstanding Public Service and the Paterson Humanitarian Award in 1970. In October 1995 the Hispanic Community of the Diocese of Paterson awarded him the Pioneer for the Hispanic Ministry Award. Also in October 1995 he received the Community Service Award from The Bergen Record. In 2009 Eva's Village bestowed a lifetime Achievement Award to Msgr. Puma. In 2012, Msgr. Puma was able to enjoy the 30th anniversary of Eva's Village, where his many friends were able to honor and thank him once more. His vision still guides all those helping people in need at Eva's Village.